Glamping is all about taking the ordinary and making it fun. So why take a taxi from the station when you can have a chauffeur drive you in a vintage car instead. Perfect for those special trips. Joining us for a special occasion or simply want to make it a holiday to remember and be treated like the Lord and Lady of the manor for a bit. Whatever the reason, our glamping guests are welcome to book our vintage Jaguar for to collect you from the station and return you on the day of departure. Just let us know the time your train is due to arrive and our chauffeur will be waiting to collect you from a local station in our Mk 2 Jaguar. We'll even give you a hand with your luggage. For a similar price as a the same journey in a taxi you can pull out all the stops to impress that special someone or just have an extra bit of luxury. 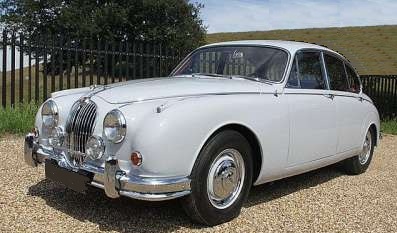 Please note that our Mark II Jaguar is an original 1950's vehicle, as such it pre-dates the requirement for seat belts in cars and is therefore not advisable to book if you have a car seat as these cannot be secured on route to the glamping site. The car can seat two adults comfortably in the rear or one adult plus two children under ten years old in the rear and one adult in the passenger seat. A return collection journey from the station and a return drop-off journey to the station is just forty-five pounds. The average price of a similar taxi journey being approximately forty pounds. Whether your are joining us for a glamping break for a special occasion such as a proposal or honeymoon or if you just want to make your stay an experience to remember, why not really put the Glam into your Glamping holiday and have our chauffeur collect you from the train station. If you'd like anything specific waiting for you in the car such as flowers or champagne or maybe some gifts if you're travelling with children, just let us know and all this can be pre-ordered and arranged for you.